There was once a linguistic landscape of incredible diversity in North America. While the continent of Europe has three main language families—Romance, Germanic, and Slavic—Native American languages can be grouped into about 30 language families. One of the largest, with languages that at one time covered an area reaching all the way from New England to the Rocky Mountains, is the Algonquian family. Algonquian languages are still spoken in Canada and the northern U.S. Two of them—Cree and Ojibwa—are estimated to have over 50,000 speakers. But even the healthiest native languages need active support to ensure their survival. The goal of the Algonquian Linguistic Atlas is “to make sure that the beautiful Algonquian languages and the cultures they embody will be heard and spoken by many more generations to come.” It isn’t just a repository of words and stories though. It is organized in a way that lets you explore the similarities and differences between the languages, and see how they are distributed by place. 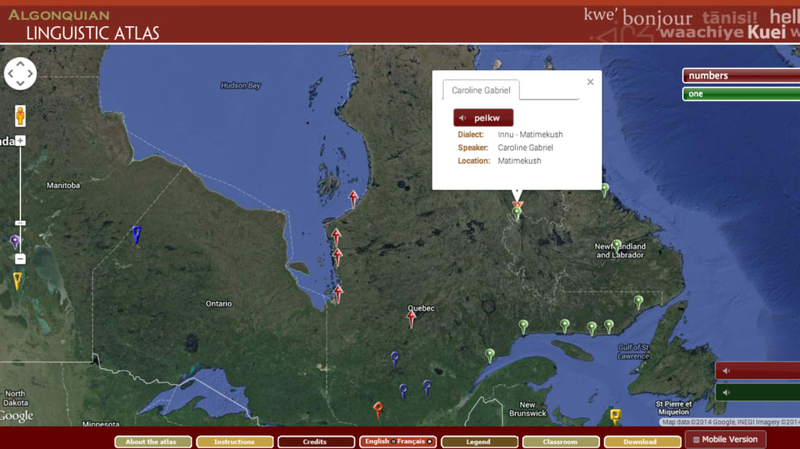 On the upper right of the map are two pulldown menus that let you choose a particular word from a range of categories (family members, days of the week, numbers…) or even whole sentences (“Did your son see that canoe?” “You guys eat those apples now.”) Then you can click a pin on the map to see what that word or phrase is in different Algonquian languages. Looking at these words in groups gets you to start asking the kinds of questions linguists like to ask when researching the history of languages. Can these all be traced back to a common proto-word? Why did p become b in Nishnaabemwin? Why is Mi’kmaw so different? The answers are clues to the mixing and movement of people over centuries. At the bottom of the map, the “Classroom” button brings up simple worksheets for learning to spot sound differences. The whole site is a simple, clear and fascinating way to get in touch with the linguistic history of our continent. Learn and enjoy here.